Along with FrieslandCampina’s growing role in the Food & Beverage industry came the need for an enterprise-wide ERP. In order to process invoices, orders, and intercompany transfers in a uniform manner, a SAP Enterprise Resource Planning system was implemented. 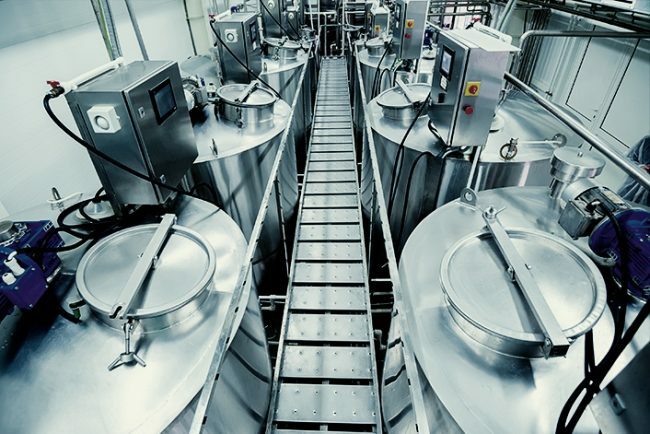 For the ERP system to work, however, INDEFF needed to make sure that both the batch and MES systems in two production sites were fully compatible. A standard to exchange data was set up, and the project was named Summit. Issues quickly surfaced: either the MES layer merely fed fixed datasets to the existing ERP (Lummen) or there was no MES at all (Nuenen). In any case, the existing MES and SCADA infrastructure proved incompatible. In order to change the automation and MES layers, an in-depth impact analysis was needed. After the fine-tuning of both levels, INDEFF compiled the appropriate documentation and went into a testing environment. The result? The SAP ERP system focuses on the corporate overview, while our MES solution takes efficiency and traceability to a whole new level. INDEFF’s custom MES solution ensures a granular traceability that is highly desirable in the dairy UHT sector. The final result of our standardized solution is that it very well might be applied in other FrieslandCampina production sites around the world. After the impact analysis was complete, the cooperation with SAP began. But which data does the ERP need and which data does it transmit? How do we make the two systems fit together perfectly? The new ERP system brought along a host of innovations: centrally automated recipe control, bills of material and sample plans. INDEFF and SAP hosted a couple of joined workshops for the management of FrieslandCampina. The resulting solution is based on the celebrated Wonderware Enterprise Integrator. By using xml files in a B2MML structure, INDEFF was able to meet international MESA standards and satisfy the client’s demands for compatible ERP and MES systems.